Labeling this movie solely as a romantic comedy is very wrong. There is so much story and emotion involved. Although this would be a wonderful way for all romantic comedies to be handled, it isn’t and coming into this film expecting that puts you at a great disadvantage. Packed full of Oscar-worthy performances, this movie kept me wanting more. Bradley Cooper is Pat, a man back from a mental hospital after having a bipolar episode catching his wife with another man. Although there is a restraining order, he’ll do whatever he can to get her back while also trying to get control of his life back. This was one of Cooper’s first major dramatic roles and he did a great job mixing humour with serious moments. Being a pet project of director David O Russell’s, whose brother has bipolar disorder, you can tell it meant a lot to Cooper to do the role justice. Jennifer Lawrence gives her normal shining performance as Tiffany, a sharp-tongued, manic-depressive widow. Lawrence won the Golden Globe and SAG for her performance. Her character Tiffany has been going through hard times, and the farther we went through the movie the more I liked the character and the more I appreciated Lawrence’s performance. She kept showing more reasons to like her. I really enjoyed this film. The trailer makes the movie seem much more comical than I found it to be. Not because there aren’t comical moments but because the movie was much more emotionally deep than the trailer portrays. You got lots of comedy throughout, and the funniest out of context ones are in the trailers making it seem like you’ll be laughing all the way through. There is emotion, you feel bad for the characters, you get attached to them, and that’s what made this such an enjoyable film for me. Characters that we were supposed to initially dislike or be wary of we grew to care about just as much as we cared for Pat from the start, and boy did I miss Chris Tucker goofing around in a movie! Where’s he been hiding? 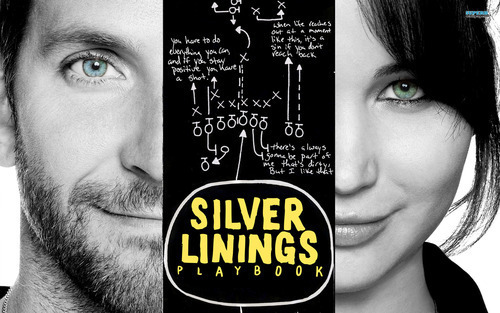 Silver Linings Playbook is nominated for eight Oscars this year, including Picture, Director, Adapted Screenplay, Actor, and Actress. I’d suggest checking it out.